Country girl Cali has been kept a secret her entire life, raised in isolation by two very troubled people. Despite her parent’s disturbing fits, Cal is perfectly content, living at one with the nature that surrounds her, and finding adventure inside the pages of her beloved books. When an awful tragedy tears her away from her remote cabin in the woods, nothing she’s ever read has prepared her for a world that she knows very little about. 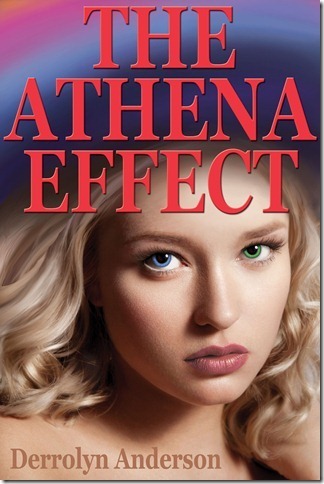 The Athena Effect is a story that truly endears you to its characters. Derrolyn Anderson, author of the Marina’s Tales series, delights us with Cal and Cal. Talk about an ice breaker! Calvin is the bad boy with a reputation and murky future, while Caledonia comes from an isolated childhood with only her parents, books and nature to educate her. After a tragic accident that leaves Caledonia to live with a distant relative, she gains the opportunity to fully experience the real world for the first time. Coupled with her ability to see and understand the auras of those around her and her aunt’s creepy boyfriend, Caledonia finds that she’s ready to escape back into isolation. Then again, she also finds someone fascinating enough to keep her tethered to a world wherein she wants to remain invisible. Caledonia is a very capable character, capable to the point where she has almost no mental character flaws. The beginning of the story not only tells of her background and paints the picture of the condition in which she grew up, but also lists all the finer points of Cali’s characterization. I was actually really surprised that all the survival skills she learned in the wild still carried to her new life in normal civilization. She’s a little insecure when it comes to being attracted to someone with more experience and a bad reputation, but that doesn’t last long. I did like that Cali is the girl who knows how to fight and survive, and she has a scary temper, too! Calvin is a brilliant contrast to Cali. He’s not exactly a ‘tough guy’, but the guy without a care, a chain of broken hearts following behind him, and a hidden layer that holds dreams and aspirations he’s long given up. He’s the character that portrays more of a change. From avoiding thoughts of the future and commitment to being a devoted boyfriend with a reason to plan ahead, Cal almost outshines Cali. The Athena Effect isn’t too long a story, and it feels as though you could fly right through it. Once Anderson establishes the danger and Cali and Cal’s conflict, it’s pretty much action through to the end of the story. I can’t imagine what will happen in the next story because The Athena Effect seems to have deeper plot lines not yet explored. This beautiful beaded necklace, created by Derrolyn herself, was inspired by the book's main character Caledonia. She has the special ability to see the aura's of other people. 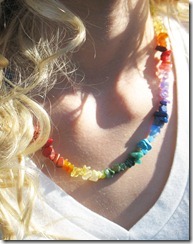 Details: Approximately 18’’ with a toggle closure, the necklace is a rainbow of gemstone chips, including : Citrine, Peridot, Green Adventurine, Malachite, Amazonite, Magnesite, Turquoise, Lapis, Howlite, Amethyst, Coral, Jasper. and Amber. If you are a resident of US/CAN enter with the free entry: "Free Entry for US/CAN entries" and put YES in the extra info section. At the "Free Entry for INT entries" enter, but don't write in anything for the extra info section. And vice-versa for residents of INT countries. Must be 13 years old or older to enter! Please comment below if you have any questions about how to enter!